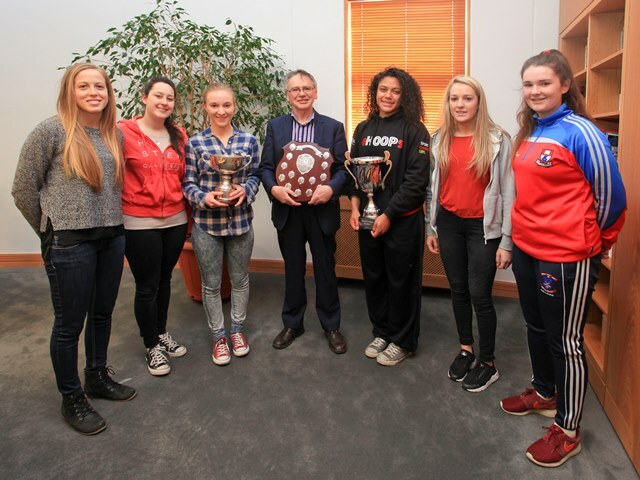 The President of WIT, Prof Willie Donnelly, met with members of WIT’s Ladies basketball team to celebrate and congratulate the entire squad on their momentous win for the college. The team recently secured the Ladies "A" Intervarsity title for the first time in the college’s sporting history over a tough three days in Galway. This historic intervarsity title was a massive effort by the whole squad; to win five tough games over a weekend is no mean feat and WIT's class came to the fore over the 3 days. On Friday WIT got the better of hosts NUIG 47 - 36 and later that day, the girls overcame Dublin IT 51 - 45, in what was a very tight encounter. The team winning run continued into Saturday as the girls fought off UCD 54 -32 which progressed them to the semi-final against Munster rivals Cork IT, who WIT had beaten in the recent Division 1 League Final. On a winning streak WIT defeated CIT 70 - 56 in the semi-final and qualified for the National Intervarsity Final against reigning champions Trinity. In a one sided final WIT ended up comfortable winners and their strength in offence and defence stood them in good stead throughout the final. WIT squad: Yvonne Corcoran, Katie Fox, Marie Micoud, Chloe Morrissey, Claire Manning, Jazmen Boone, Jane Crowley, Aoife Brett, Laura Heffernan, Ciara Twomey, Cliona Martin, Rahel Taheny. Coach: Jim Dudley. Assistant Coach: Helena Rohan.